We always look forward to our annual trips to Hawaii as we consider it our second home. It has become like our second home because we truly feel the warmth and ohana as soon as we enter the Trump International Hotel Waikiki Beach Walk. 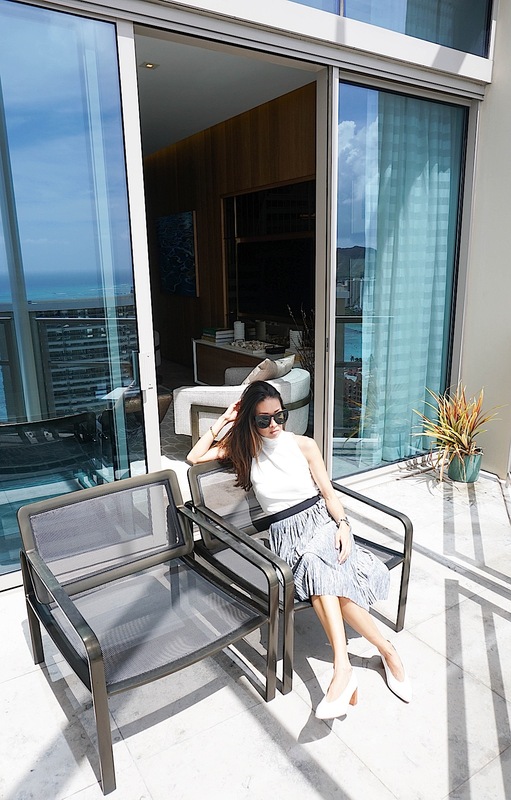 We have been staying at the Trump Waikiki since it opened in 2010, but this year we had the privilege of viewing one of the four Penthouse suites that this luxury hotel has to offer. The 2,260 square feet Waikiki Penthouse Suite resides on the top floor of the Trump hotel. 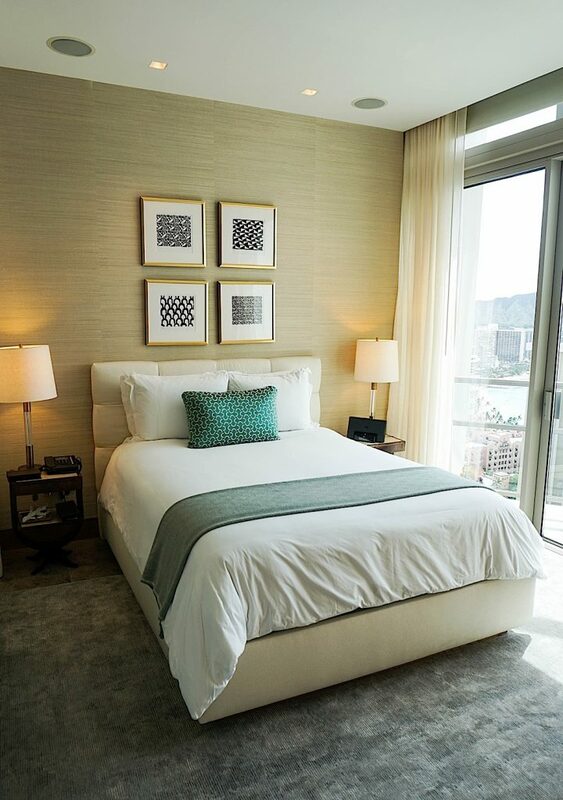 It boasts floor to ceiling windows with views of the pristine Waikiki beach and the magnificent Diamond Head crater. 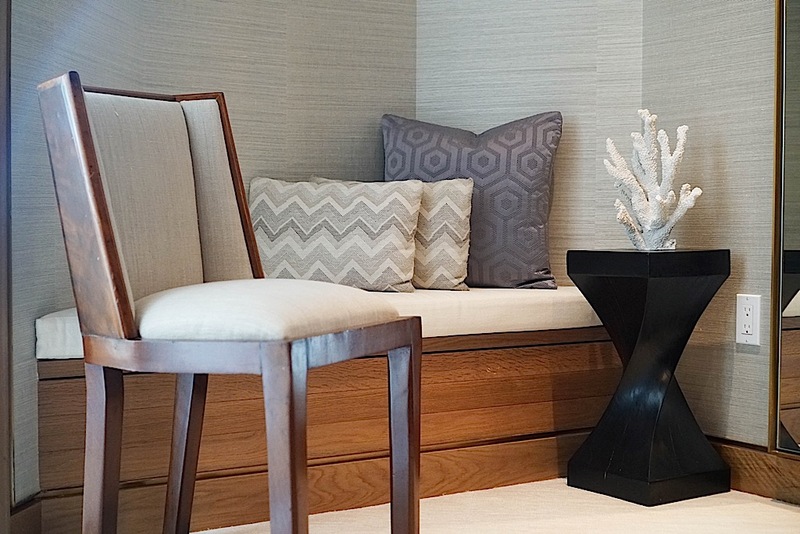 As soon as I stepped into the Waikiki Penthouse Suite, a calmness immediately came over me. 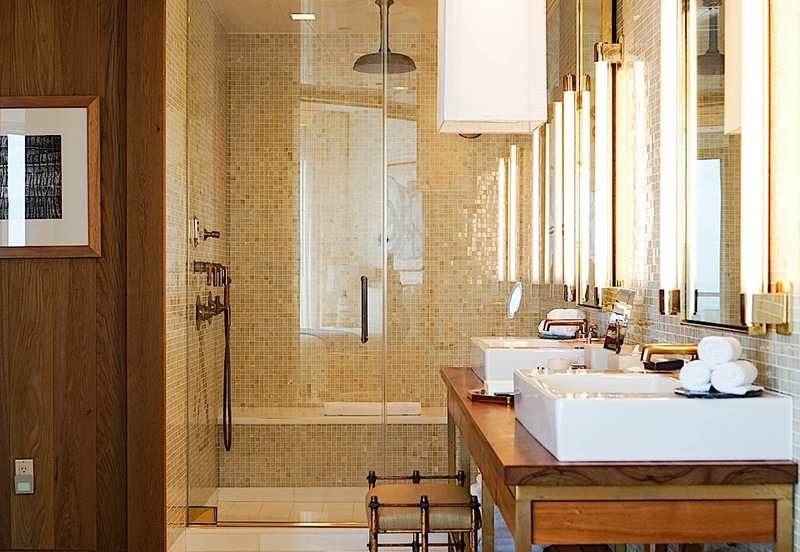 The cool color palette of the suite, along with the light wood and shiny brass accents, gives off a bright and airy vibe. 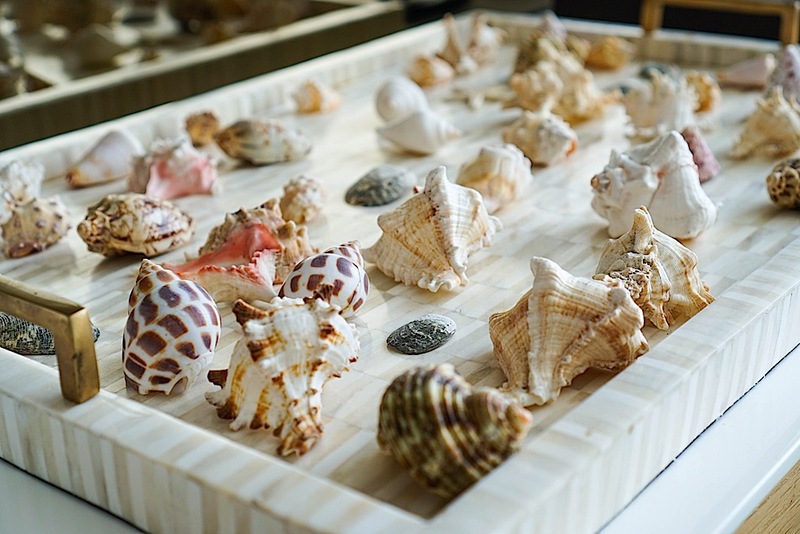 The ocean-inspired artwork coupled with the delicate seashell display beautifully marries the elements of the sea with the modern feel of the suite. 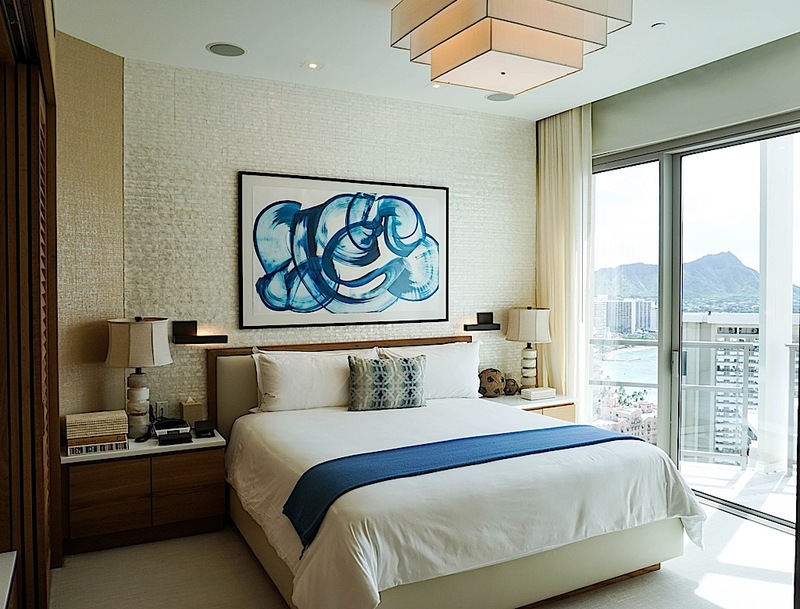 The Penthouse suite features two spacious king and queen bedrooms, 2.5 luxurious bathrooms complete with signature Trump robes and slippers, beautiful walk-in closets, and a deep, wooden hinoki furo soaking tub in the master bedroom, and in-suite Bosch washer and dryer (a major bonus for families). 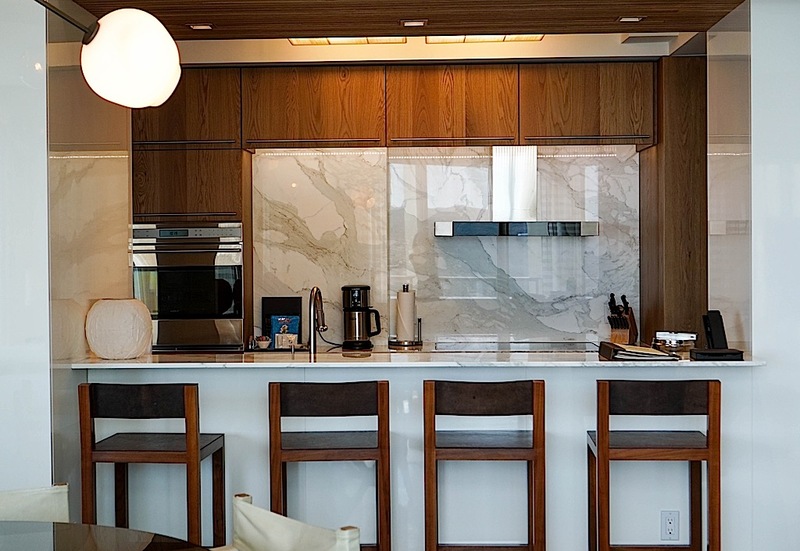 The full, gourmet kitchen is fully equipped with Wolf, Miele, and Sub-Zero appliances and marble countertops as well as everything you need to cook in suite (if you plan on doing any cooking while on vacation). Guests in the suite also receive a special package that includes unlimited soft drinks, bottled water, juices, tea and coffee with additional snack items. 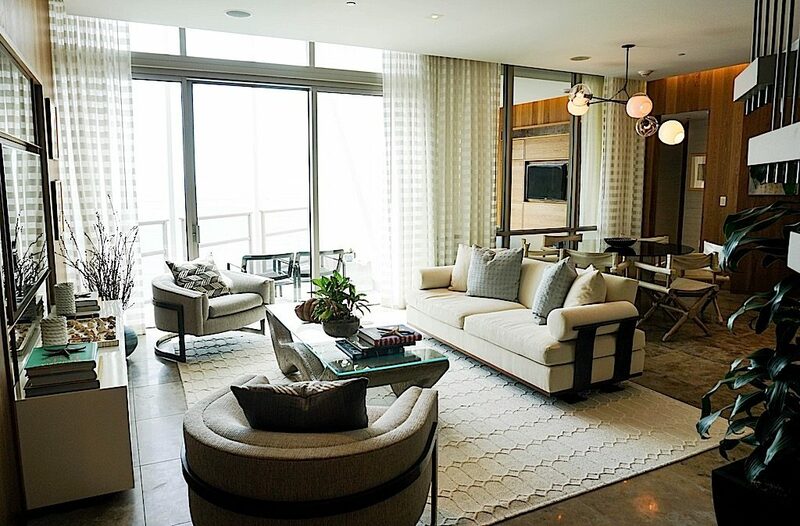 This particular Penthouse boasts three lanis (balconies), totaling almost 1,400 square feet, with incredible views that will leave you speechless. 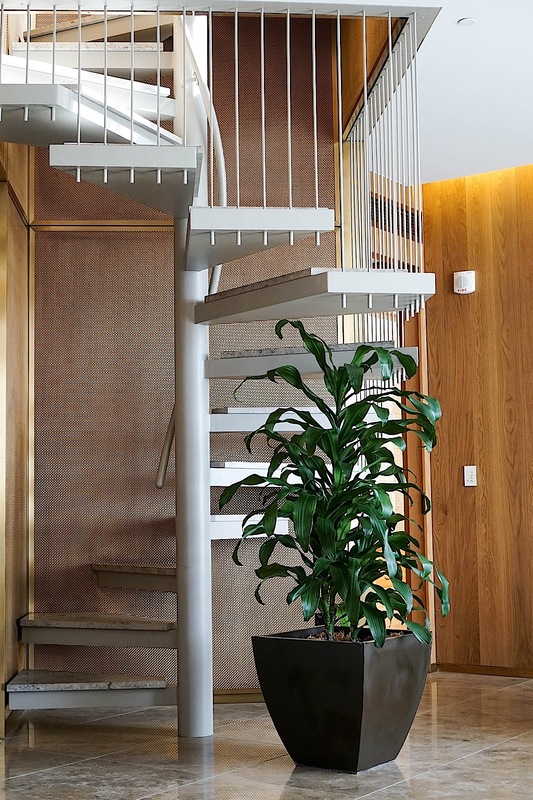 Other than the stunning views from the suite, another focal point of the room is the spiral staircase that leads to one of the most magnificent balconies I have ever seen. Up the staircase, you open the door and your jaw drops to the floor. 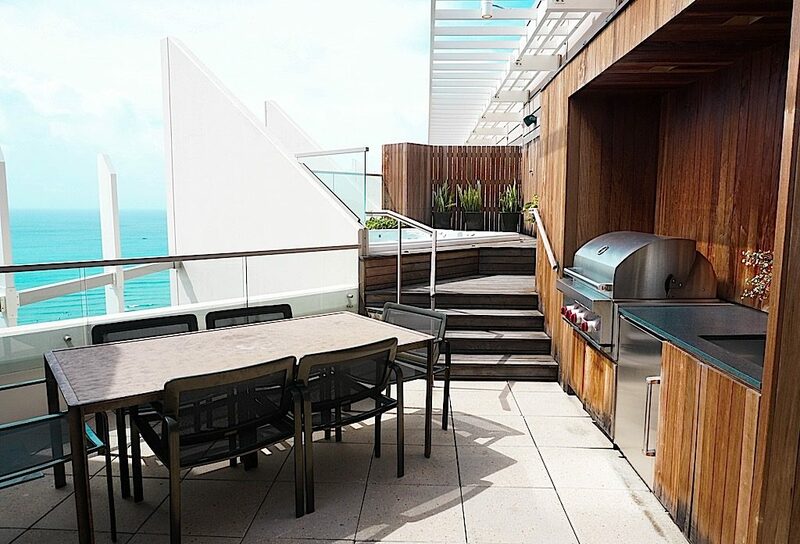 The door leads you to your very own private rooftop balcony complete with a wet bar, grill, dining table, and enormous Jacuzzi tub overlooking the ocean. Here you get views of the iconic Mt. Le’ahi on one side and the shimmering stretch of Waikiki Beach on the other side. While the Penthouse suites are beyond your most unbelievable Hawaiian dreams, the guest room suites are just as luxurious. We typically stay in the premium, two bedroom plus den, ocean view suite which is the perfect size for our family of five. The 1,600 square feet suite actually sleeps eight, with separate bedrooms and two queen sized sleeper sofas in the den and living room. Funny story, when our last child was still in a crib, we used to put the crib in the master bedroom closet and use it as a third bedroom (yes, the closet is THAT large). 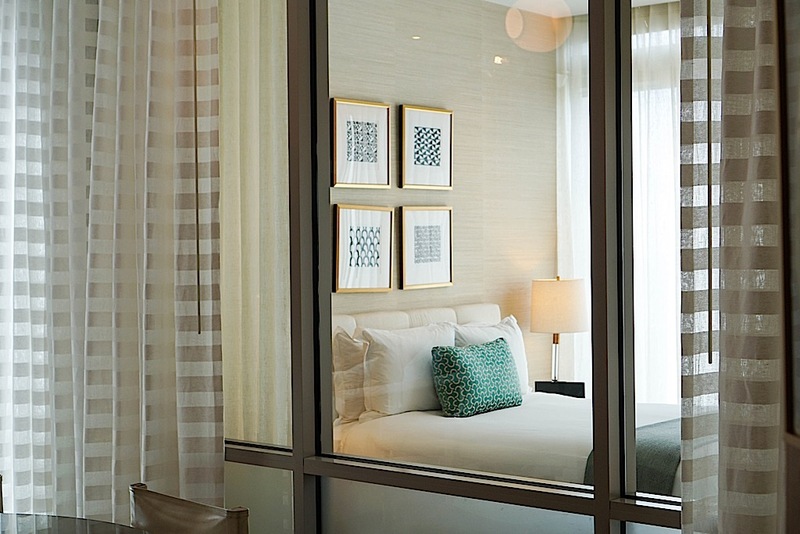 For more information on all the guest suites, click here. Before you head to the beach, borrow a beach bag on the main floor. The bag is complete with towels, cold waters, and fruit as you head out. And upon availability, they also have floaties, boogie boards, and sand toys that you can borrow for free! The infinity pool on the lobby’s 6th floor also provides swimmer diapers for the little ones free of charge as well as sunscreen so you don’t need to bring your own. They have the best nachos and alcoholic drinks from the pool side menu. There are two Starbucks located super close to the hotel and three ABC Stores where you can get just about anything from hot meals to everyday essentials. If you exit the hotel and walk through their parking garage, there are a host of food trucks right next to the hotel for your local Hawaiian fixins. Henry’s Place is on the way to the food trucks and has the best Mango Pineapple ice cream. The Trump’s In-Yo Café has one of the best international buffets and we always end our vacation with brunch here. Each room comes with a washer and dryer unit which is incredibly helpful when traveling as a family. Also, a full sized crib is available upon request and comes complete with bedding and travel sized Johnson’s & Johnson’s toiletries for the baby. The children have always received personalized notes from the hotel upon room arrival along with coloring books, stuffed animals, and sand toys in their beds. The service and friendliness of the staff is unparalled which is why we have been coming here for over six years in a row. From the warm lei greeting to the delicious Hurricane popcorn, gourmet cake pops, and infamous Honolulu Cookie Company treats upon arrival, we have been spoiled by the Trump Hotels. Yet year after year, they still manage to exceed expectations in every way. And if you need anything else that isn’t already handed to you, Dori at the Trump attaché will provide comprehensive personal and business services in a jiffy. The Trump Waikiki is the only Forbes five-star luxury hotel on Oahu and also #1 on Trip Advisor since October 2010 and provides the ultimate luxury experience. 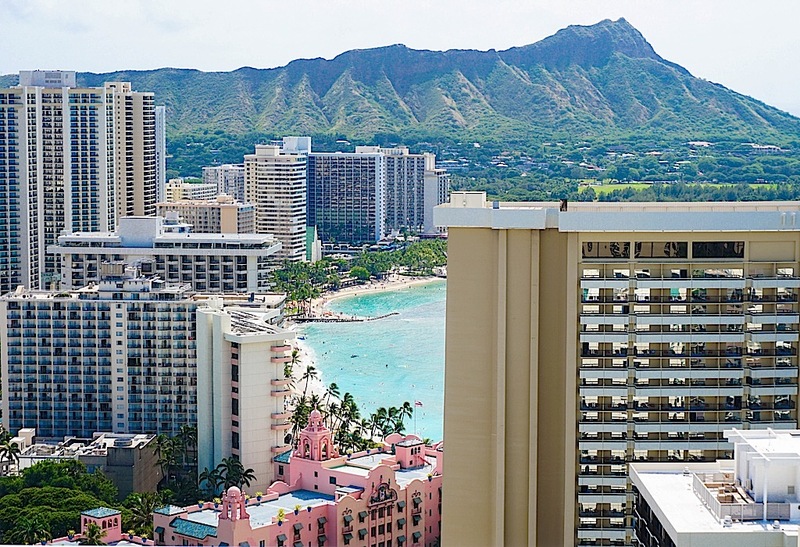 Just steps from the renowned Waikiki Beach and from exclusive, world class shopping and dining, the hotel’s location coupled with the luxury ambiance makes it the ideal resort property for your Hawaiian getaway. The hotel typically offers special offers, makes sure to check them out here before you book your room. So once you arrive at the Trump Waikiki, make sure you give Rob and Dean at valet services a warm aloha, get leied and escorted to the lobby floor by Julia, and stop by the attaché desk and say hello to Dori who will provide you with anything and everything you need. Thank you to the Trump International Hotel Waikiki for really making our Hawaiian vacations so memorable and to Bianca Mordasini for allowing me to experience another level of luxury at the Waikiki Penthouse Suite. Such a stunning place!!! 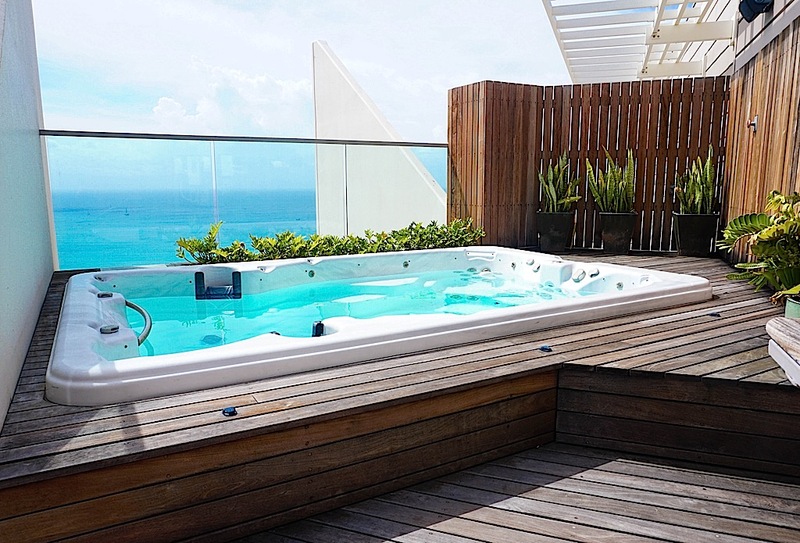 That suite looks all sorts of amazing, and that rooftop jacuzzi!!! Yes it really is amazing Cinddie! Isn’t the rooftop balcony fantastic?! Hi Thomas! You’re right, he does know his real estate and luxury hotels. The ocean view is just to die for! Oh my gosh! That hotel and views look amazing! It sounds like such a great getaway and such a beautiful place to take pictures. I am obsessed with those black booties by the way! Thanks Mariann. I love this hotel so much and we have so many fond memories here. The Penthouse is spectacular and so happy I was able to share it! Thanks for sharing such a detailed look! Thanks Gunjan! I always say location and view are totally worth every penny and this hotel and Penthouse do not disappoint at all! This place looks so amazing. We’re planning our Hawaii trip this summer. Definitely staying here. Just wow!!! Yes Rachel, you must stay here. It is really the best luxury hotel in Waikiki. The location is everything and I cannot say enough about the staff and service. I am loving these photos! We usually stay down the street but am going to book this place next time. Thanks for sharing. This is a really beautiful hotel and you’ve had an amazing suite!! Thank you Jordan. It is indeed a lovely hotel and this Penthouse suite is incredible! Thanks Camille. Not only is the location perfect since it is right by the beach, the views and staff are amazing. You look so gorgeous in all of these photos. I dunno where you find these outfits, but that black dress and the detail on it is just beautiful and fits you so nicely. Hope you had a blast back in Hawaii!!! Thanks so much Danielle. That black dress is actually from H&M! Hawaii is always paradise, but staying at the Trump makes it that much better! Wow, this is very” Trump”, first class all the way. Such a beautiful property ! And love your style as always. I am obsessed with the booties ! I always look forward to your posts ! Thank you Gracie. 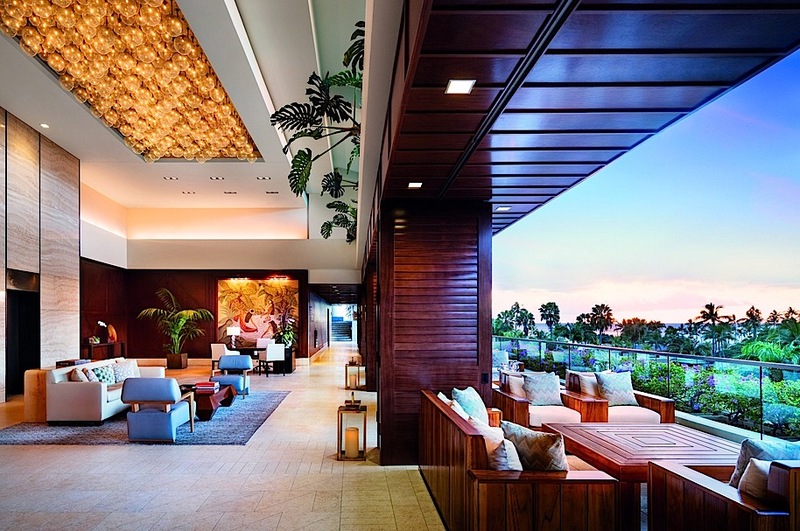 Trump does know his hotels and the finer things in life and this hotel exemplifies both excellence yet also the warmth and friendliness of Hawaii. I think that my favorite parts about this hotel are the beachy vibes that are spread throughout, that magnificent spiral staircase, and of course the bathtub and private pool! 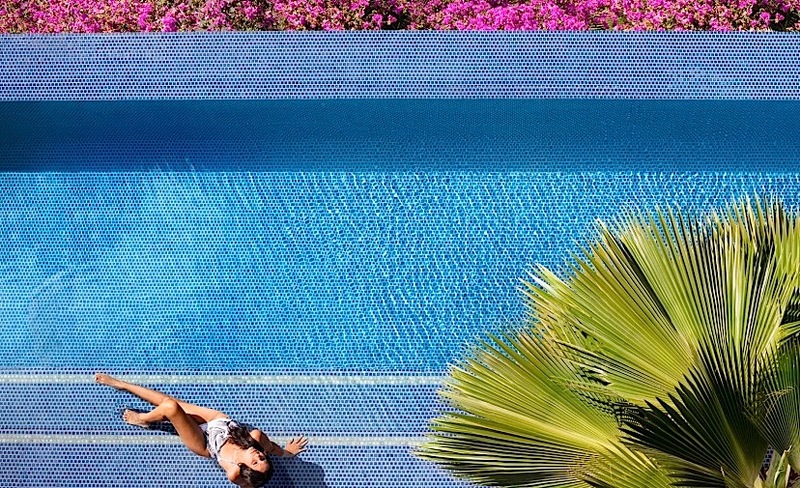 I can only imagine what a dreamy and tropical experience it would be to stay here! Yes, the beach vibes with the modern elements of the room really tie Hawaii and the five-star luxury qualities together. Thanks Stephanie! I’ve been meaning to go to Hawaii because I’ve never been! I’ve heard and seen how beautiful it is! I wish I could travel as much as you and stay in hotels like this! Maybe one day when I have the budget to do so! I would love to do that. These pictures are amazing Christine! Sounds like a great trip! Thanks Linh. I think being in the West coast it is easier to go to Hawaii which is a short 4.5 flight away than from the East coast so now that you are here, you definitely have to go visit one day. Aside from being paradise, the food is amazing and the water is so warm even in the winter. And when you do go, a stay or visit to the Trump is a must! Yep … I confirm you always stay at the best hotels! This place is so dreamy and how huge is that room with all these amenities. It’s seriously like living in an apartment. That bath tub just gave me life. One thing I always pay attention in a hôtel is the bathroom. This is serious next level! Love the gorgeous pictures you have shared here! I always love Hawaii and the kids really love it there too. The Trump makes it so easy and it really does feel like home there. You must go visit again soon! I love all the photos and the detailed information you shared! We are booking our travel plans for June now and Trump Waikiki is where we are going to stay!! I convinced my husband that we have to stay here instead of Sheraton where we’ve stayed in the past. Thank you for all the helpful hints! I wish we could stay in the penthouse suite but a suite will do! Hi Marie! I am overjoyed that you booked the Trump for your summer vacation and I promise you that you will not be disappointed! They will treat you like family and you will definitely stay again once you’ve experienced life at the Trump. I am excited for your vacation and want to come along too! Wow I love the beach chic theme of the suite. The kitchen bar, the rooftop pool, and that view have to be my favorite aspects of the suite. Sounds like a wonderful way to travel. As always, love your style. I agree that the rooftop balcony is definitely the focal point of the PH suite, but the marble kitchen and views are so heavenly too. 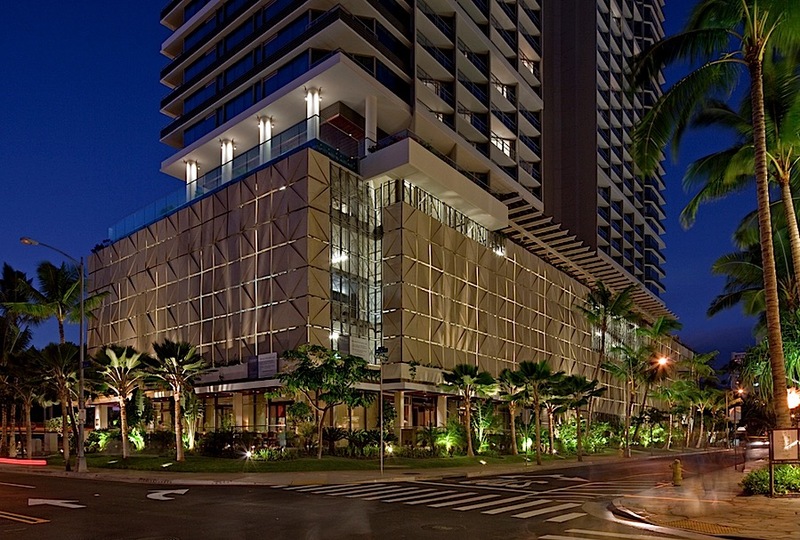 It is difficult to find such a luxury hotel that is close to the ocean in Waikiki, but the Trump Waikiki has it all! I have never been to Hawaii but my significant other and I are thinking of going this year. I will definitely check out the Trump hotel. Thank you for sharing! Oh, you will love it Jasmine! It is truly our go-to vacation destination location. It is perfect in so many ways and you won’t be disappointed. If you are looking for a luxury hotel that is close to the ocean and also makes you feel comfortable and treats you like family, the Trump is your place. I am truly speechless. Trump certainly exceeds all expectations when it comes to Penthouse Suite perfection. I love all these gorgeous pictures and your extremely thoughtful descriptions. I love how you used the room closet as a room when your youngest was a baby and I’m also impressed that your children get messages and coloring books. I think it’s really fabulous that the company goes out of its way to make even the smallest guests feel welcome. Staying here would be a dream. Thank you so much Jennifer! Yes, the Trump hotels definitely caters to all of its guests including the young ones. =) Thanks for your thoughtful comments. Oh yay! I love Waikiki too and so jealous that you are going there soon! Can I please come travel with you next time?! You stay at some amazing places babe and definitely loving that outdoor hot tub! Looks so relaxing!!! I would love to go travel with you babe! The rooftop balcony is so cool, isn’t it? 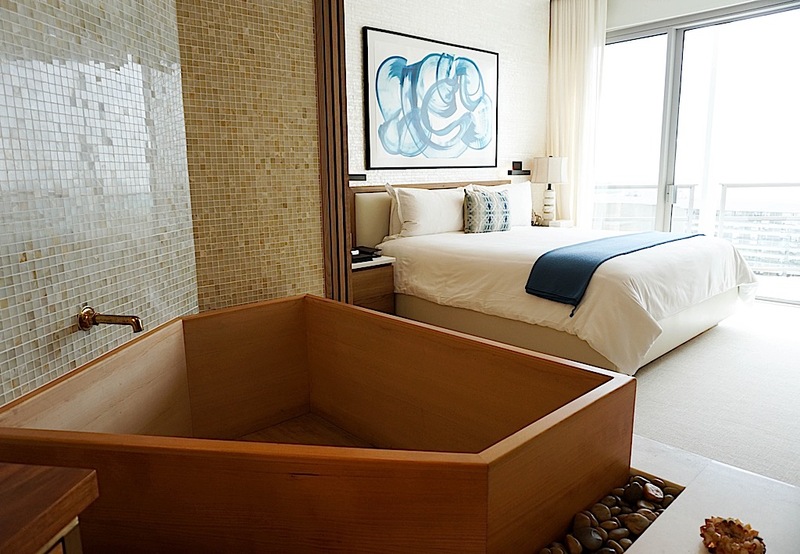 I love the idea of relaxing in the jaccuzzi while overlooking Waikiki Beach. You have to go to Hawaii Jenn! You would LOVE it. If you ever do go, definitely stop by the Trump even if for drinks or their restaurants! Is this even real?!?! What a gorgeous penthouse suite!! I mean… no words!! Thanks for sharing, Christine! So overdue for a trip to Hawaii, so will have to live vicariously through yours!! What incredible views!! It is a very modern looking room too, well, a semi corporate yet not entirely minimal one. It reminds me of the Wolf of Wall Street film. I’d love to visit Hawaii, those acai bowl breakfasts and off the map beaches I have seen look awesome. I love the scenery in your posts, such a nice place! Love your photos. Happy 2017!! omg i’m drooling all over that bath tub! it’s so pretty and lux! I definitely would want to stay there when I go hawaii! To be honest I haven’t been to Hawaii yet. Too many travel destinations on my to visit list and I’m struggling to tick them off! Hi, Christine! happy New years!!! It is very great to see your posts again as well as you!! What a glam experience you had, this place is so luxurious and stunning. I love all these outfits you are wearing in each scene. I have never been to Hawaii, but for sure, I will check this place out when I visit. Omg Christine this suite is incrsible, talk about “another level” of luxury! 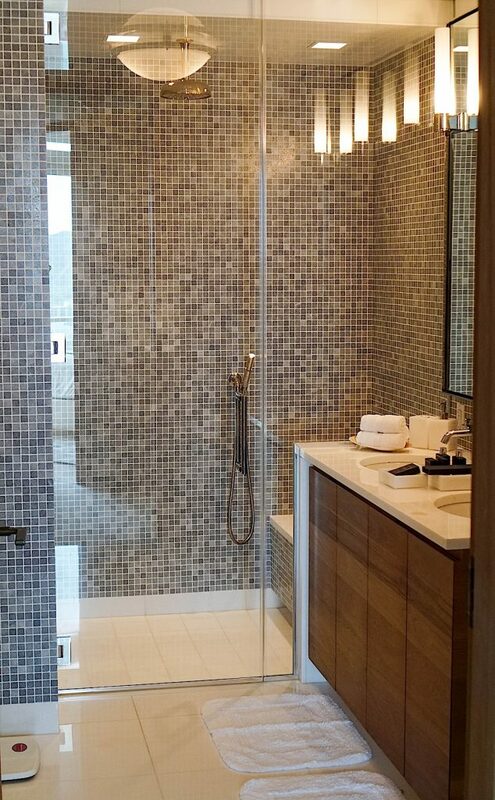 That master bedroom soaking tub is something of dreams! And how did I miss that you went to Hawaii during the holidays!? So much fun. Thanks so much for all the insightful hotel tips too, I feel totally ready to go and make the most out of a visit! OMFG this place is so stunning. I’m for sure staying here when i visit. Everything is perfection and the marble in the kitchen is life goals! I can stay here taking IG pics all day haha. Wow the hotel looks impressive. Looking to all your incredible pictures, all I want is to fly over there.. sigh 🙁 Anyway thanks for sharing this, may be one day I’l make it :)By the way you look stunning as always. This suit looks so damn amazing!! The view is terrific. Would love to visit it! Looks like an absolutely gorgeous vacation babe! I would love to visit sometime 🙂 Hope you’re having an amazing 2017 so far! Beautiful woman in beautiful photos! I can understand why you consider Hawaii a second home, being from California I spent almost every Xmas there growing up. Perhaps something similar for you? I just ask: WHY TRUMP? Did they give you a free stay? Just wondering! Wish Trump stuck to what he knows and does best, his chain of hotels haha! This is such a stunning hotel to stay at Christine! Always love your reviews and shots of the fantastic places you stay at. That view of the beach and private pool with jets are to die for! Now you make me want to go back to Oahu hehe. What a gorgeous suite with a view that I can only describe as paradise! Hawaii looks so incredibly beautiful. That stunning blue ocean is absolutely nothing short of breathtaking! I really want to go to Hawaii soon! The hotel and the room looks absolutely amazing and even though it wouldn’t be my first choice, because of you know who. I might take it into consideration. This place looks so gorgeous and so do you babe! Beautiful photos and outfits babe!!! Definitely will have to add this hotel and destination to my bucket list. THIS PICTURES, THE PALCE WHERE YOU ARE. iNCRDIBILE LUXURY AND BEAUTIFULLY DESIGNED. THE VIEW FROM THE JACUZZI IS STUNNING. WHAT’S ELSE??? OMG it really is amazing ! The penthouse and the view in Hawaii! It must be a very nice holiday for you!!! Wow, what a luxurious hotel!! This seems like the perfect place to be for a vacation. I`m also in love with your boots! Happy New Year! What a gorgeous suite – looks like a dream. I especially love all the home-y touches. I could use some Hawaii in my life right now! Hope you had a great vacay! This is paradise in paradise! I wouldn’t be too sure I would step out of the suite looking at how beautiful and comfortable it is and the service definitely sounds fit for a king! You look amazingly gorgeous in that setting too! Oh my goodness these photos are stunning and this review makes this sounds even more amazing! I know your stay was so enjoyable! Oh my, what a gorgeous room, looks so luxurious and chic, a perfect place to stay on vacation! I can’t get over the view especially, I could use some of that sunshine and the beautiful blue ocean! Wow what a fancy and nice hotel, I’m in love with this place. And I love Hawaii! Oh my goodness I want my house to look like this hotel- it is actually perfect 🙂 That photo of you in the pleated skirt with the stunning beach backdrop actually belongs in a magazine! That looks like the best place ever! Love the photos! wow babe, that interior is just goals! i’m loving all the looks you’re wearing as well, killing as usual! such a great post dear. I’m so envious of all the trips you get to go on. I lovee Hawaii and I have actually visited the island quite a bit in the past. 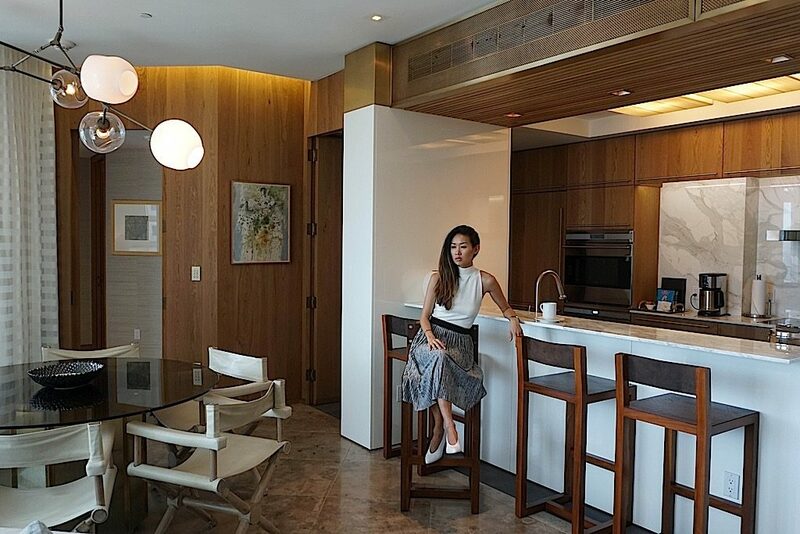 This hotel interior looks so amazing and I hope you had an amazing stay and time in Hawaii. Wow the decoration of this hotel is so amazing!! 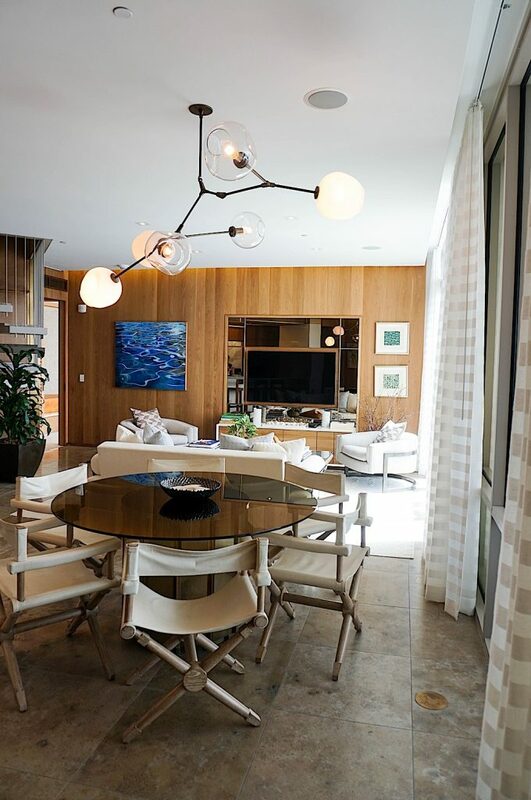 I love how the rooms are so bright and nicely lighted! Seems like you had an amazing time!! I honestly don’t think I’ve ever seen a more amazing hotel suite! I love that they take such amazing care of you and your family, and they rooftop? Slay me now- a dream. I think we discussed that I also love visiting Hawaii, every island is my favorite. 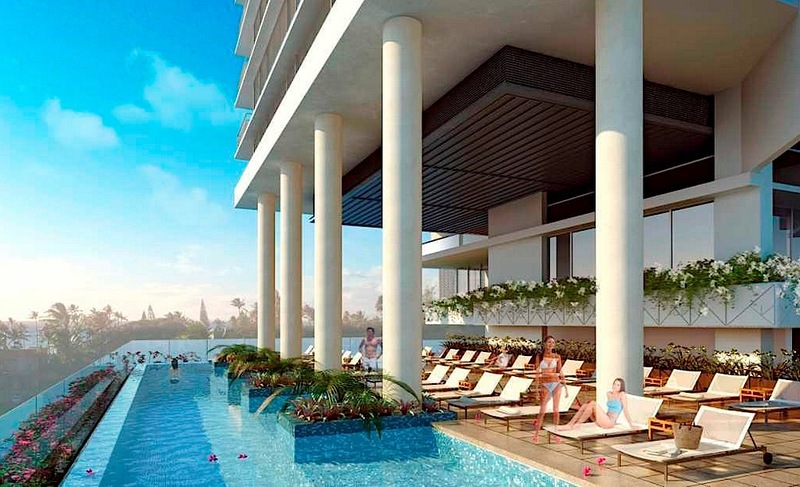 Trump hotel in Waikiki looks even better simply because of it’s location. I love how you always do a great view every time when you travel and stay at a nice hotel. It gives us great ideas whenever we travel to the same destinations. 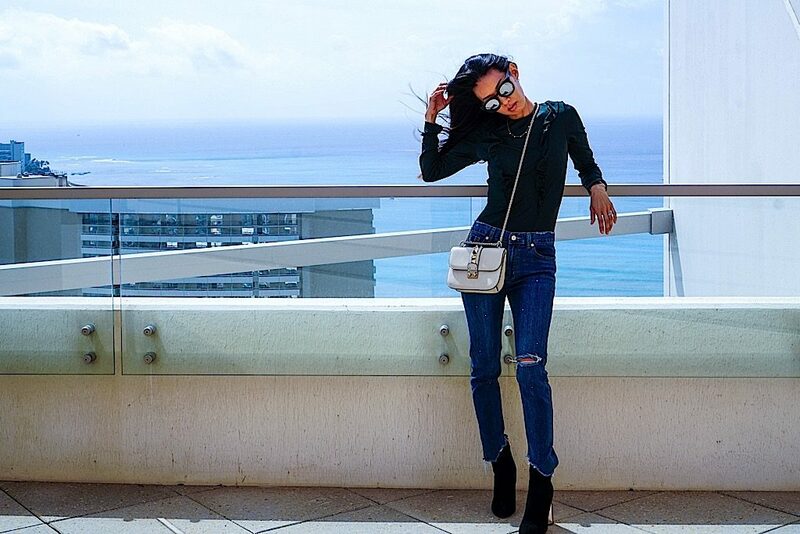 These pictures are gorgeous, so are your outfits. Thanks Jo! I do love Hawaii and it’s the perfect destination for everyone. Luckily for me, my hubbie does enjoy a good view and I just reap the benefits. Wooow it looks so amazing there. The photos are so stunning. Thank you Margot. Hawaii is definitely paradise! How far is the hotel from the beach? I’m debating between the Trump Hotel and Royal Hawaiian. The Trump seems much nicer but the beach access at Royal Hawaiian looks to be more convenient. Thanks!